“I absolutely love dogs, and I wanted to be in business for myself,” says Jennifer Schoonmaker, who opened at The Foundry Shops of Barrington in 2006. Named after her Lhasa apso Cody and her shih tzu Carl, the shop is decorated with colorful photos of the two pampered pooches. Cody & Carl’s stocks only all-natural food for dogs and cats, made in the U.S. with no fillers or grains, including frozen raw food. “We specialize in food for pets with allergies or digestive problems,” says Schoonmaker. Likewise, the chew toys, such as Bully sticks, jerky treats and elk antlers, are all-natural and include no rawhide. “Our elk antlers come from North American elk and are gathered humanely, after they fall off naturally,” she says. Pet beds are custom-made in Canada, and pet clothing ranges from holiday costumes and winter coats to customized shirts and logoed team apparel, even hair bows and neckties. Pet guardians can also find toys, collars, leashes, grooming and training aids, bowls, and gift items for the pet lover. 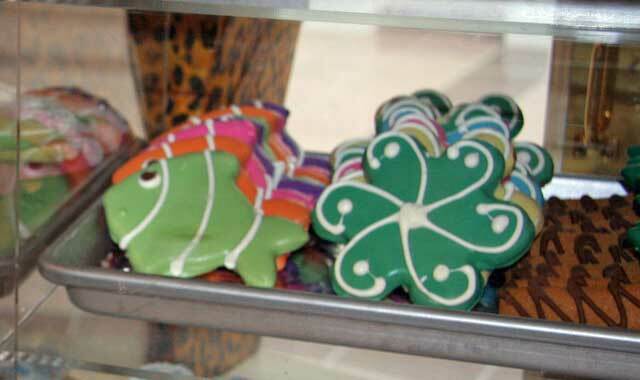 The shop also carries a huge selection of baked treats from local vendors who bake only for pets. 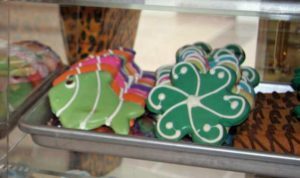 “We’re known for our cookies, cupcakes and biscuit treats,” says Schoonmaker. Hours: Mon.-Fri. 11 a.m.-5:30 p.m., Sat. 10 a.m.-5 p.m., Sun. noon-4 p.m.
Stocked with current styles from designers like Rebecca Taylor, Elizabeth & James, Citizens of Humanity and Alice + Olivia, this is city boutique shopping at its best – in the suburbs. Owner Ashlee Rooney opened her shop in Glen Ellyn in 2004, after the Chicago transplant was “horrified” at the ’burbs’ dearth of fashion-conscious, personal-service shops. With a business background and “years of shopping experience,” along with a grandmother who owned her own boutique for years, Rooney decided to fill the void. The fashionista travels from L.A. to N.Y.C. to bring the latest styles and unique designs to fill her shop with clothes to fit any wardrobe, from soccer mom to high society glams. Fuschia also carries bags, jewelry, scarves, sweaters, coats and shoes. The shops are open Mon.-Sat. 10 a.m.-5 p.m. (later on Thurs. ), and Sun. noon-4 p.m.
For Ruth Burke, quilt shop owner is a second career, after 40 years working with computers. Burke sewed as a little girl, but she didn’t get the quilting bug until she was married and decided to finish a project begun by her mother-in-law. From then on, she was hooked, so when she got the chance to purchase the former Hopscotch Square in February 2012, she didn’t hesitate. Located in Sewing Concepts, in the historic Woodstock Square Mall Building, the store carries everything from batting and patterns to templates and cutting tools. Burke is constantly bringing in new fabrics in bold colors and bright prints. 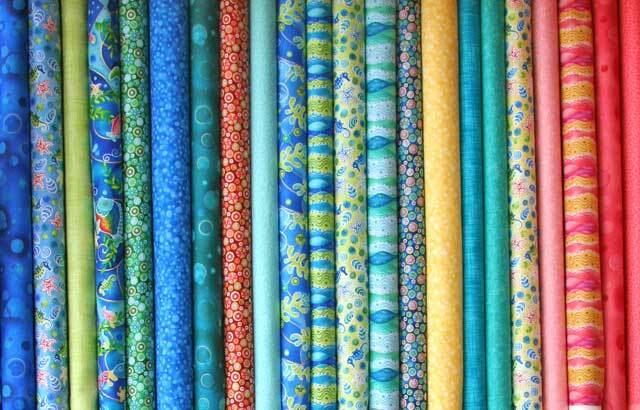 Burke is also partnering with Sewing Concepts to offer quilting, sewing and embroidery classes. Hours: Mon.-Wed. & Fri. 9 a.m.-5:30 p.m., Thurs. to 8 p.m., Sat. to 4 p.m. 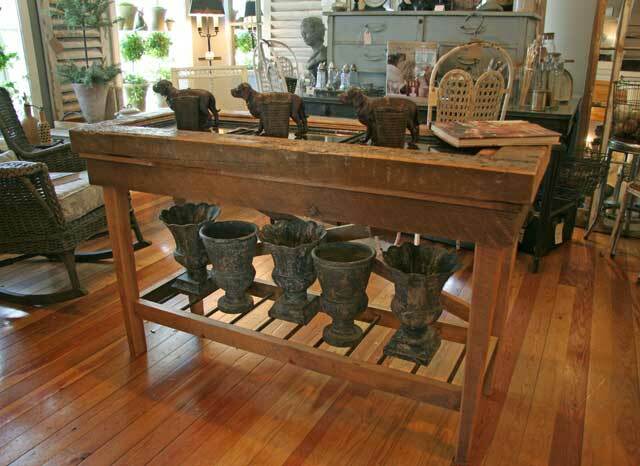 This interior design/antique firm offers restored antique furniture, architectural artifacts, antique and vintage bric-a-brac, custom handmade furniture, custom floral arrangements and interior design services. 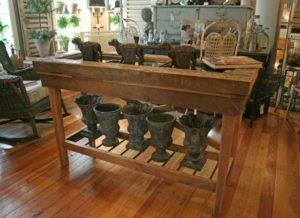 One item obtained while hootin’ and hollerin’ is a large window made up of nine small panes, salvaged from an 1800s Tennessee farmhouse. (It’s already sold.) Whitt tends toward French Provincial or English Cottage flair, but the shop’s selection is eclectic. There’s Jessen’s custom barn wood furniture; restored antique and vintage pieces, including a 1950s Heckman writing desk; original oil paintings from England; pottery; transferware; lamps; even a 1950s-era animal print chair and ottoman. New items are also for sale, such as Lizzy jewelry. The shop’s name in French means “still life,” of which Whitt painted many while studying art in France. “It also means ‘play again,’ and we believe there’s still life left in these pieces,” says Whitt. Hours: Tues.-Sat. 10 a.m.-5 p.m. This entry was posted on Tuesday, September 25th, 2012 at 12:00 pm	and is filed under Nooks & Crannies. You can follow any responses to this entry through the RSS 2.0 feed. Both comments and pings are currently closed.